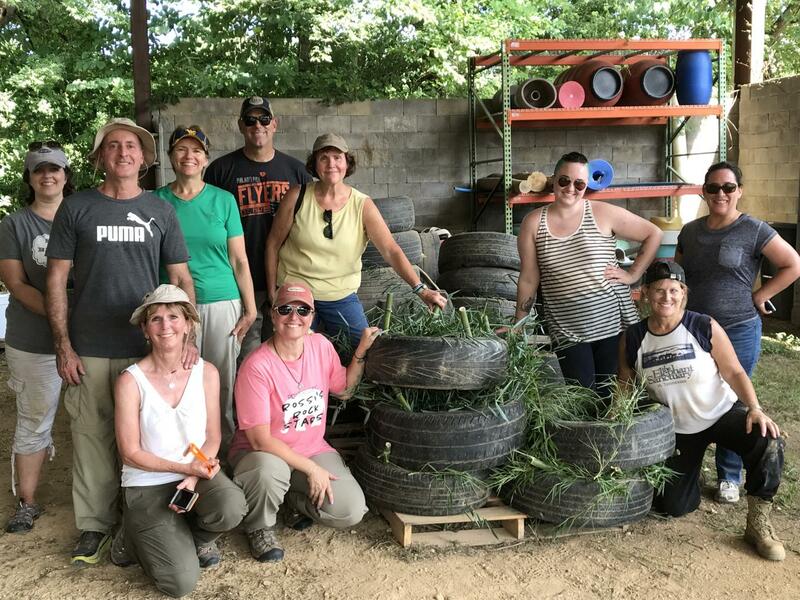 Volunteers help further the mission of The Elephant Sanctuary in lots of ways! If you are interested in donating your time and energy to help, read below for details about volunteer opportunities. The 2019 Volunteer Application has closed. Thank you for your submissions. We will be in touch soon with lottery results. As the saying goes, “many hands make light work.” Volunteers provide The Sanctuary with additional help to complete a variety of work projects that may be too numerous or time consuming for regular staff to complete. Individual volunteers only allowed on-grounds on official Volunteer Days designated by The Sanctuary. The Sanctuary will begin accepting applications for all 2020 Volunteer Days in late January 2020. Sign up for EleNews to receive notification when the application period begins. Flexible and willing to have fun while working at The Sanctuary. No matter what task you are assigned during your Volunteer Day, you can rest assured that your donation of time and energy will make The Sanctuary a better home for our elephants. Will I get to see elephants? Volunteers will not have any direct contact with the elephants. The elephants are never put on display at The Sanctuary. If the volunteer work project happens in viewing proximity of the elephants, then so be it. There is no guarantee that volunteers will see elephants. 8:00 a.m. orientation at our Welcome Center in Downtown Hohenwald, TN. 12:30 p.m. – 3:30 p.m. Complete work projects and depart. Due to needs and safety concerns, we’ll limit each volunteer day roster to twelve individuals. This group will be directly supervised by The Sanctuary Staff at all times. You can apply for yourself and one other person. Each volunteer 'party' is limited to two in order to allow more people the opportunity to participate. If I volunteered last year, can I volunteer again this year? In order to allow more people to participate, participants in the 2019 Volunteer Days are ineligible to volunteer again in 2020. If you volunteered in 2019, you will again be eligible in 2021. Accepted volunteers will receive a 'packing list' via email. Volunteers are responsible for their own accommodations. We’ll happily provide recommendations. We’re animal lovers here, but this is for the safety of all involved, we do not allow pets on site. The Elephant Sanctuary is a tobacco-free facility. Only volunteers who have registered and been approved by staff will be allowed on grounds. Are you interested in helping to provide a safe-haven dedicated to the well being of retired elephants? Are you passionate about sharing things you care about with friends and family? Are you willing to share with others the story of the elephants that call The Sanctuary home? If the answer to these questions is "yes," we’d like you to consider becoming an 'EleAmbassador' for The Elephant Sanctuary in Tennessee. The Sanctuary will provide you with an online orientation, materials, and guidance in how to raise awareness in your community about the needs of elephants in captivity and the crisis facing elephants in the wild. * The Elephant Sanctuary does not provide lodging, meals, mileage reimbursements or stipends for EleAmbassadors.